As you know, Apple earlier in the month has promised to bring back dozens of recently-removed iWork features over the course of six months. In keeping with that promise, a barrage of updates has gone live Wednesday on the App Store and Mac App Store, adding new capabilities to the iWork suite of applications on Macs, iPhones, iPads and iPods. This is the first major refresh since last month’s downgrade stealthily removed arguably less popular though essential features in favor of cross-platform document compatibility between OS X, iOS and the web. The updates are now live on the App Store and the Mac App Store so check out the Updates tab in the App Store storefront on your iOS devices, or choose Software Update… from your Mac’s Apple menu. 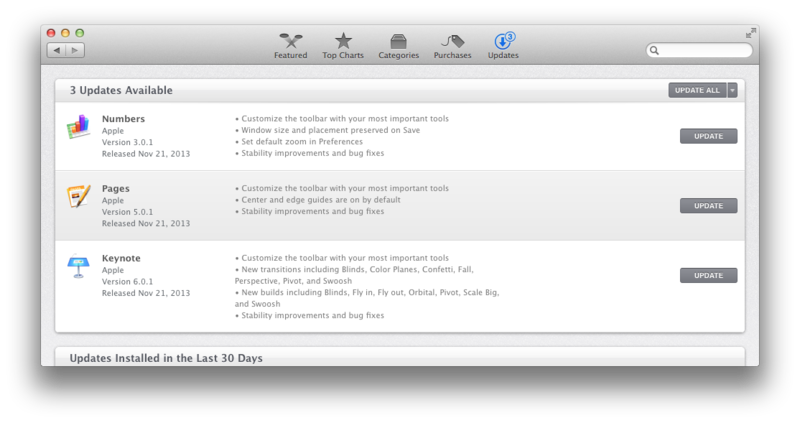 Here are release notes for both Mac and iOS updates. 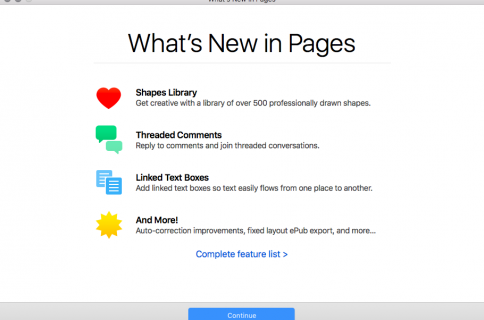 Pages version 5.0.1 ($19.99 290MB download) contains stability improvements and bug fixes, along with the ability to customize the toolbar with your most important tools. Also, the new Pages version now has center and edge guides enabled by default. Numbers version 3.0.1 ($19.99 190MB download) lets you customize the toolbar with your most important tools, set default zoom in Preferences and it preserves your window size and placement on Save. Keynote version 6.0.1 ($19.99 444MB download) includes new transitions including Blinds, Color Planes, Confetti, Fall, Perspective, Pivot and Swoosh; new builds including Blinds, Fly in, Fly out, Orbital, Pivot, Scale Big and Swoosh; and the ability to customize the toolbar with your most important tools. Pages version 2.0.1 ($9.99 266MB download), just like new versions of Numbers and Keynote, brings iOS 6 support and the ability to open a document in another app. The updated versions is a 231MB download. Numbers version 2.0.1 ($9.99 234MB download) includes various stability improvements and bug fixes. Keynote version 2.0.1 ($9.99 463MB download) includes new transitions including Blinds, Color Planes, Confetti, Fall, Perspective, Pivot and Swoosh; new builds including Blinds, Fly in, Fly out, Orbital, Pivot, Scale Big and Swoosh; and stability improvements and bug fixes. Keep in mind these are free upgrades from previous versions if you have upgraded to Mavericks. Apple during the October 2013 iPad keynote announced making iPhoto, iMovie, Pages, Numbers and Keynote available as free downloads to customers who had purchased new iOS devices. In another surprising move, the iPhone maker has made OS X Mavericks and future updates free to Mac users.